If you look closely at a low viewing angle, you can see the tiny pillars in this prototype Guardian VIG panel. Last week we took at look at one way to achieve very-high-performance windows: adding additional layers of glazing and multiple low-emissivity (low-e) coatings. This week, we’ll look at another option that’s even higher-tech: vacuum-insulated glass. We know how well vacuums work in reducing heat flow. That’s how Thermos bottles function. We have a thirty-year-old Stanley Thermos bottle at home that keeps hot chocolate piping hot for eight hours. Most of the air molecules have been removed from the double-walled stainless steel shell of a Thermos bottle, and this dramatically slows conductive and convective heat flow. You might remember from high-school physics that conduction depends on having molecules close together so that kinetic energy can be transferred from one molecule to the next, while convection depends on molecules of a warm fluid (such as air) moving from one place to another and transferring heat in the process. 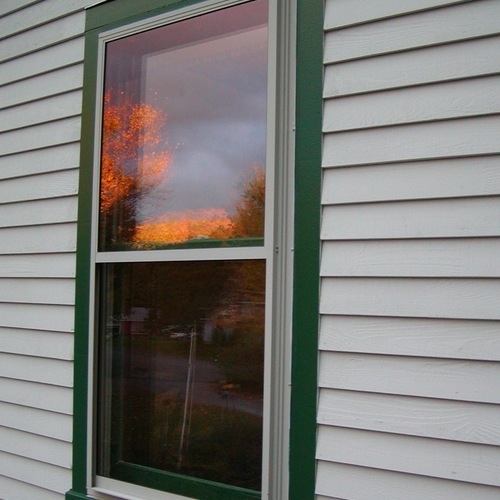 The same principle can be used in a window if the space between two layers of glass is evacuated. 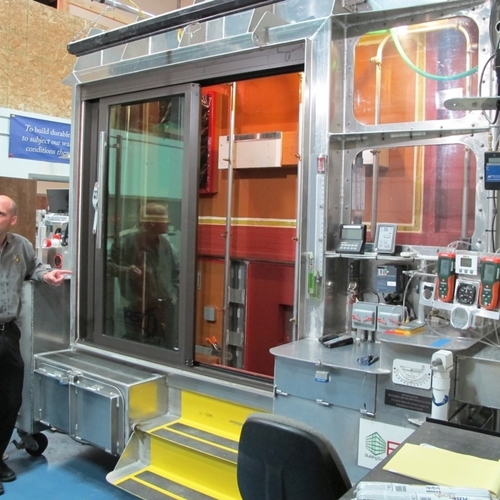 That’s what Michigan-based , one of the world’s largest glass manufacturers, is doing with its Vacuum-Insulated Glass (VIG). While not yet on the market, Guardian has had this product under development for a number of years–and a few foreign companies have VIG windows on the market already. Guardian’s product separates two layers of glass by a very thin space–just 250 microns or a quarter-millimeter–using tiny, almost invisible “pillars” to keep the panes of glass from sucking together and touching. 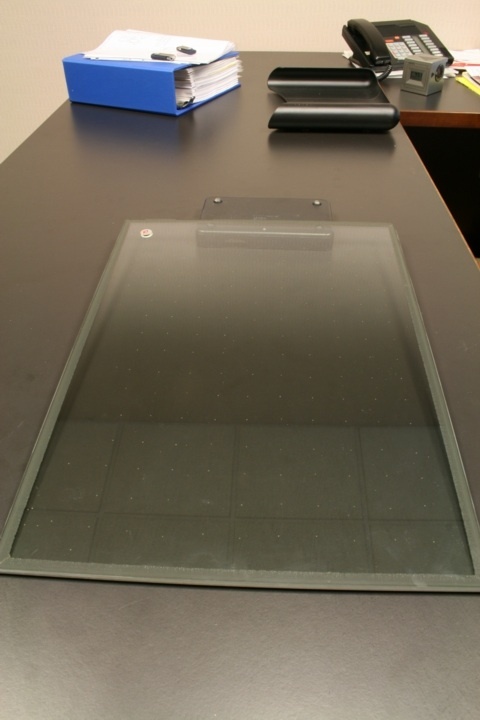 Instead of standard clear glass, Guardian uses an advanced low-e glass as one of the layers. 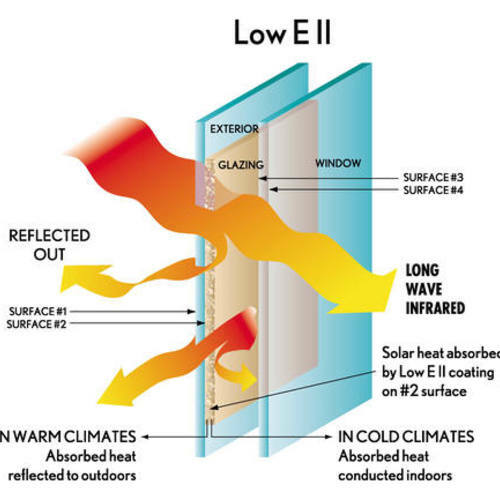 The use of low-e glass is critically important, because it slows down the third form of heat transfer through windows: radiation. 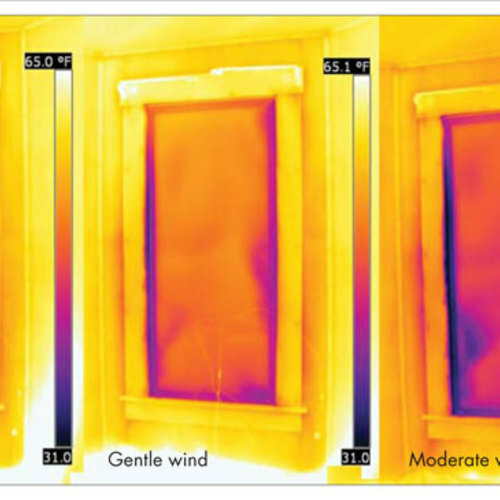 Radiant heat flow can occur without air, so this becomes the primary means of heat loss through a VIG window. The performance of Guardian’s VIG glazing is indeed very good. Scott Thomsen, vice president and chief technology officer at Guardian Industries, told me that their VIG will achieve at least R-10 (center-of-glass) insulation, with potential for R-12. The use of the latest-generation low-e coating is crucial to this level of performance. If the company were using the best low-e from five years ago (which was made by sandwiching two low-e coatings together–low-e2), the performance would only be about R-7 center-of-glass. The newest low-e sandwiches three layers together (low-e3), significantly increasing the insulating performance of the VIG. The company has been aiming for performance comparable to a triple-glazed window with two low-e coatings and krypton gas fill—the sort of window I wrote about last week. Thomsen says they will achieve this performance at about the cost of a triple-glazed window with argon gas fill (argon is a lot cheaper than krypton) and with a VIG glazing unit just over a quarter-inch thick, rather than over an inch for triple glazing. Even though the vacuum needed in a VIG window is “softer” than that used in a Thermos bottle (10-4 torr instead of 10-6 torr in the parlance of vacuum physics, or one-hundredth as strong a vacuum), the edge seal is still extremely important. If the vacuum seal is lost, that R-10 to R-12 window would probably end up not much better than R-2. 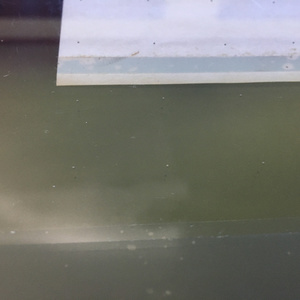 According to Thomsen, the edge seal is a “hermetic, glass-to-glass bond using a non-organic, lead-free solder glass frit material.” In other words, it’s not a glue or traditional sealant that’s commonly used in sealed insulated-glass units. He tells me that the “frit” is a “modified version of a proven material that has been around for several decades” and is used in both flat-screen and older-style, picture-tube televisions. One drawback to a VIG window is that the tiny pillars that keep the panes of glass separated slightly affect the optical clarity of the windows. When viewed at a low angle, these tiny beads are visible to some people. Guardian has found in focus groups that about 50% of people were able to see them. It’s unclear how much of an issue this will be in windows used for views; it shouldn’t make any difference in windows above the vision plane or in skylights. Guardian hopes to begin initial production of their VIG in late 2011 with fully automated production anticipated for mid-2012. Thomsen expects that their VIG will begin trickling into the market in early 2012, depending on how quickly their partners proceed with product development. (Guardian provides glass to window manufacturers; the company does not itself produce finished windows.) 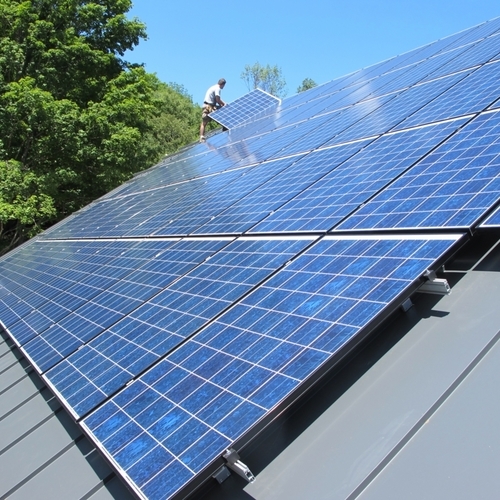 He anticipates that initial market growth will be strongest in Europe, where stricter energy codes will go into effect in 2012, followed by the U.S. when Phase II Energy Star standards are instituted. We are in for some exciting times in the window industry for sure! What do you think? Are vacuum-insulated glazings going to make it? I can't wait to see these windows when they come out. How much will this glass cost over and above standard insulated low-e glass? 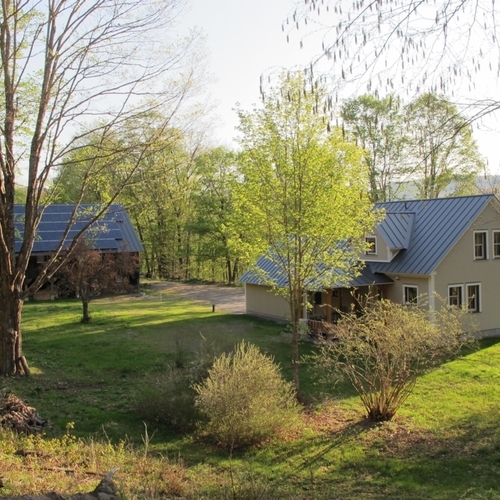 I expect that these windows will be a good match with passive house specs. 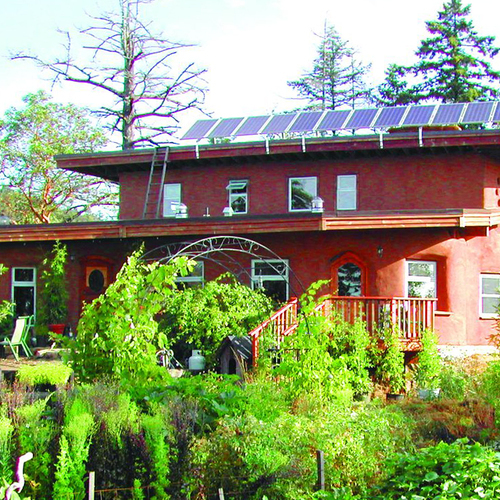 The DOE is working on a volume agreement to reduce the price of triple pane windows. Will these windows be considered as well? It seems like their R value is better. Also, you mentioned the "bubbles." Is visibility also reduced so that these types of windows may have problems with the LEED standards for visibility? What would be the payback with these windows are their project cost? Will Guardian offer multiple SHGC options for our varied climates? It's unclear how Guardian will configure VIG. Because it requires a very-high-performance triple low-e coating (low-e3) glass, it will likely not have a very high SHGC. I think this glazing will be most appropriate on non-south orientations where solar heat gain is not a priority. Also, I don't think Guardian will be the supplier of glazing panels to end-users. They will provide the glass to fabricators. Some fabricators will install the VIG units into simple glazing extrusions; others might provide "insulated glazing units" in which the VIG becomes "one" of the layers of glass--so that triple glazing would be achieved with about the thickness of standard double glazing. Thus, it would be possible for fabricators to offer a wide range of tinted and very low-SHGC glazing panels by varying that other pane of glass--at least for commercial applications where more glazing options are typically available. I don't really know if Guardian will focus more on commercial glazing or residential window markets, but I'm guessing it will be more commercial--and perhaps skylights. Given the glass is under constant pressure and the expansion and contraction effects of thermal as well as atmospheric pressures. I would be interested to know if they have done any long term environmental testing that shows how long the vacuum was maintained. What about a real world worst case scenario with differential heating,, where a window has been installed without regard to summer shading, and the occupant isn't green aware. In that case the external pane might reach an elevated temperture (?130-140 degrees F?) and the inner pane might be at 60 degrees F (Air Conditioning on Maximum in a small room trying to cool a whole house). Because the panes will expand and contract with temperature, the two panes are trying to become different sizes from their factory assembled size (one bigger and the other smaller). That differential temperature growth will put a strain on the edge joints and the panes themselves. So the question is has the glazing been tested for this situation? Glass and true hermetic seals are neither known for their flexibility. The Guardian announcement is very similar to a product that has been on the market for many years manufactured by Pilkington. You write: "a few foreign companies have VIG windows on the market already." Who knows about anyone else globally than Pilkingtion - NSG Group that has VIG windows available in the market? Aside from the glass being under constant pressure, there are also problems of expansion and contraction effects because thermal and atmospheric pressures. This would be a problem if not given an early solution. But the Guardian is saying something reliable for a moment. If the space between the panes is filled with air or a gas like argon, the gas will expand when it gets hot and contract when it gets cold. However, if the space between the panes is a vacuum, then there isn't any thermal expansion and contraction. The problem with diffrent expansions can be worked out. Atter all thermous bottles have been around for years with one side piping hot and the other cold. I used to do helium leak testing whare we just used clay to seal componets down to 1 x 10 -10 millitorr.